Frosting a cake seems easy enough, but anyone who’s tried knows just how difficult it is to create a clean and smooth surface. 1. BE DILIGENT. “It really starts in the oven,” says Sousa. “Baking the cake to the right consistency is essential for it to stay together.” So, don’t underbake, overbake or take creative license with the recipe! 2. COOL THE CAKE. Next, it’s important to let a cake properly cool before icing it. If the cake is still warm, the icing not adhere well. 3. START WITH A CRUMB COAT. Once it’s cooled, ice the cake with a thin layer of the frosting, which is called the “crumb coat.” Spreading this thin layer on and letting it dry will seal in all the little crumbs so they can’t mess up your final layer. Your cakes may not be this fancy, but your frosting can be just as smooth. 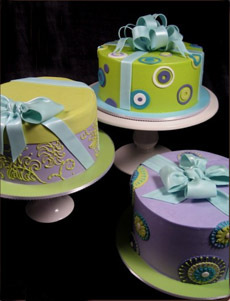 Photo courtesy JustCakes.com. 4. ADD THE FINAL FROST. After about 15 minutes, it’s time for a second and final frost. Start with a thick layer on the sides, working from the top toward the bottom, always wiping off your spatula before putting it back in the icing bowl. Finally, spoon a mound of frosting in the center of the top of the cake and spread it out toward the edges. Take long strokes, all in the same direction, until you have a smooth, crumbless finish. Watch this video on how to ice a cake. Icing is made with confectioners’ sugar (also called icing sugar), frosting is made with granulated sugar (table sugar). The two words are often used interchangeably, but that doesn’t make it correct! Find our favorite cakes and cake recipes in our Gourmet Cakes Section.